Bangkok (Thailand) – March 25, 2019 (travelindex.com) – The Thailand Convention and Exhibition Bureau (TCEB) – Business is elevating Thailand’s fast-growing MICE sector by forming a series of deep partnerships with major MICE players supported by its new marketing plan and trade show strategy. This year TCEB – Business is looking to deepen partnerships with existing partners and identified new ones at trade shows where it has confirmed attendance, IMEX Frankfurt, IMEX America and IBTM World, Spain. Mrs. Nichapa Yoswee, TCEB’s Senior Vice President – Business said, “TCEB – Business is using these trade shows as a platform to deepen and create new partnerships with the regional and international business events communities, while developing and growing Thailand’s MICE industry. “This year the key aim is not just selling destinations and winning business. TCEB’s unique ‘Thailand Redefine Your Business Events’ branding reflects its new role as a thought leader. It also positions TCEB as a co-creator, partner and collaborator for the business events industry,” Mrs. Nichapa added. One example of this new partnership in action will be at IMEX Frankfurt. 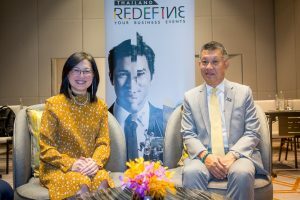 TCEB – Business is taking the lead for Asian Association of Conventions and Visitors Bureau (AACVB) and working with AACVB members to develop a model for economic impact assessment of the MICE industry. The objective is to equip Asian CVBs with a common and reliable tool to justify and show the industry’s impact on economic growth. The ultimate goal is to gain enhanced trust from government, policy makers, business community, social and academic entities in the economic importance of MICE industry. Other objective is to form PCO partnerships where TCEB matches local Thai PCOs with international PCOs to collaborate in organising business events in Thailand. TCEB – Business is now actively looking to work with ICCA targeting overseas PCO who are ICCA members. TCEB – Business will help identify and attract overseas business events related to 10 key industries highlighted in the Thai government’s “Thailand 4.0” model: Future Automotive, Smart Device, Health Tourism, Biotechnology, Food Processing, Robotics, Aviation and Logistics, Biofuel and Biochemical, Digital, and Integrated Medical Service. Through this initiative TCEB is coordinating with relevant Thai government agencies to host overseas business events, or “co-locate” with local events in the same industry to leverage industrial synergies. Mr. Sumate Sudasna, President of Thailand Incentive and Convention Association (TICA), said the partnership strategy should help deepen its involvement with TCEB. “TCEB – Business provides the essential foundation to deepen partnerships that further develop Thailand’s MICE industry. It also encourages Thai MICE operators to improve their products and services so they can cater to the needs of new potential business. “Part of TICA’s efforts is collating intelligence from members participating in international trade shows to help formulate a marketing strategy. Now we’re seeing the results from TCEB’s ‘deepened partnership’ initiatives that are beneficial for TICA’s members in terms of business planning and strategy,” Mr Sumate concluded. The Thailand Convention and Exhibition Bureau (TCEB) has been the country’s official government agency supporting, promoting and developing global and regional business events (Meetings, Incentives, Conventions and Exhibitions – MICE) in Thailand since 2004. As a strategic partner and sanctioned liaison, TCEB co-creates successful solutions with companies and organisations to realise MICE events of every scale and type. The Thailand Incentive and Convention Association (TICA) is a non-profit organisation established in 1984 to help the growth of Thailand as a preferred destination for meetings, incentives, conventions and exhibitions. TICA’s membership consists primarily of key players in the MICE industry, including: hotels; destination management companies (DMCs) and tour operators; professional convention organisers (PCOs); professional exhibition organisers (PEOs); contractors; convention and exhibition centres; advertising agencies; local attractions, entertainment establishments; travel industry suppliers and academic. TICA focuses its efforts and resources in a number of key areas, comprising: incentive-related activities; hosting and co-ordination of familiarisation visits; and planning and undertaking sales promotional trips, and participating in trade shows such as AIME, IMEX Frankfurt, IMEX America, IT& CMA and IBTM.